10th through 15th century. 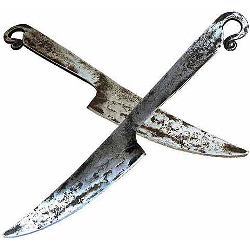 This is a functional and correctly shaped medieval Iron Table Knife. Hand forged and sharpened this knife will satisfy the needs of living history groups as well as re-enactors and collectors. Overall Length is approximately 10", Blade 4.75" long, 1" Wide. Please allow 4 to 12 weeks for delivery.